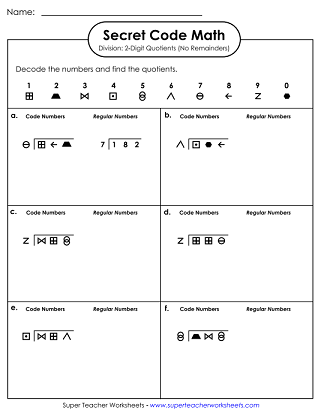 The printable "Secret Code Math" worksheets below cover dozens of different math topics, including addition, multiplication, division, and subtraction. Students first decode the numbers in the problems, then they solve. To view the Common Core standards associated with any given lesson, click on the (CC) icon below any worksheet's description. 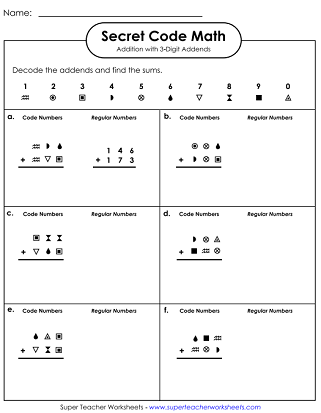 On this worksheet, students will decipher the code to create 3-digit addition problems. Then they'll solve each one. To solve these addition problems, students will first need to decipher the symbol addends. This column addition worksheet has three addends. Each one has 2 or 3 digits. These coded problems have up to 4 addends, with 2, 3, or 4 digits in each. These secret code math subtraction problems each have 2-digits. Students do not borrow or regroup to solve. Students will need to borrow/regroup to solve the subtraction problems on this sheet. After decoding the numbers using the key, students will subtract to find the differences. Find the differences of pairs of 4-digit numbers. Round each number to the nearest hundred. On this one, children will figure out the numbers and then round to the nearest thousand. Decode sets of symbols into numbers. Compare each group with "greater than," "less than," or "equal to." Use the symbols <, >, and = to compare each set of numbers. Compare pairs of 5-digit numbers using <, >, and =. Decode the factores. Then write the product for each basic multiplicaion fact, up to 10x10. Write the product for each basic fact, up to 12x12. First decode the numbers using the key at the top of the page. Then find the product for each pair of numbers. Solve the 3-digit multiplication patterns. Find the products by multiplying 4-digit numbers by 1-digit numbers. Here you'll multiply pairs of double-digit numbers together. Multiply 3-digit numbers by 2-digit numbers in this cypher-code activitiy. Convert the pictures into numbers, then write the quotient for each basic division fact. For this activity, students will be solving problems that have 1-digit quotients with simple reminders. These problems have 3-digit dividends, 2-dgit quotients, and no remainders. This version has 3-digit dividends and 2-digit quotients. Each prolbme has a remainder. 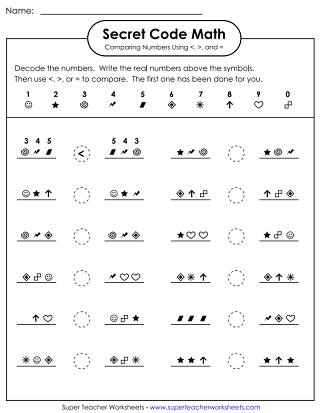 This page has an full index of math worksheet topics on our website. Download math task cards covering a wide variety of topics. Scoot! is a whole-class math game that will have students moving from desk to desk as they solve math problems. Here you'll find a collection of primary, intermediate, and advanced multiple step word problems.